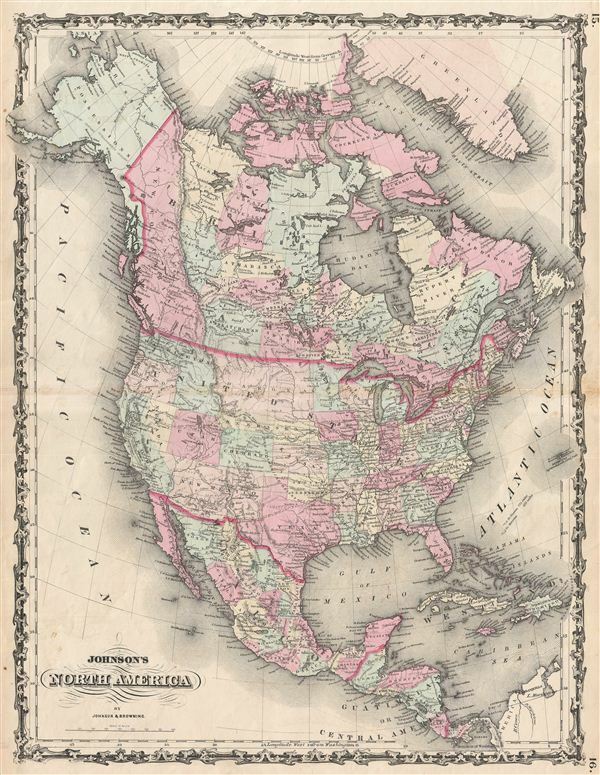 A beautiful example of A. J. Johnson's 1861 map of North America. Offers a fascinating snapshot of North America, particularly the United States, Canada and Mexico, just after the outbreak of the American Civil War. States roughly follow the 1861 configuration with archaic borders between Nevada and California and Nevada and Utah, whose capital is noted as Fillmore City. Nebraska extends westward as far as Utah and a massive Washington State borders with Dakota. Several important transcontinental routes are shown, including the U.S. Mail Route through Texas and New Mexico and the Pony express route to Sacramento. Also notes numerous American Indian tribes throughout. Canada and Mexico are shown in considerable detail with color coding according to region. Features the strapwork style border common to Johnson's atlas work from 1860 to 1863. Published by A. J. Johnson and Browning as plate numbers 15-16 in the 1861 edition of Johnson's New Illustrated Family Atlas. This is the last edition of the Johnson Atlas to bear the 'Johnson and Browning' imprint. Subsequent editions reflect Ward's 1862 acquisition Ross C. Browning's shares in the firm. Very Good. Minor wear and discoloration along origninal centerfold. Blank on verso.